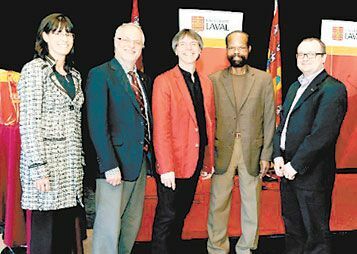 Hubert Nigel Thomas was one of two persons honoured by Laval University as part of its third annual award: Homage to Artists. The award is given under the auspices of the Vice-Rectorate for Research and Creativity. Its goal is to recognise and reward talent and creativity in those men and women who transmit their passion, knowledge and talent for the benefit of their faculty, the university and the society at large. H. Nigel Thomas was born in Dickson Village, St Vincent. Before establishing himself in the province of Quebec at age 21, he had already worked as a teacher and civil servant here in St Vincent. In Montreal, he taught at the Protestant School Board of Greater Montreal. In 1988 he became professor of American Literature in the Department of Literature of Laval University. In 2006, he took early retirement to dedicate more of his time to writing. Apart from publishing several short stories and critical articles in literary journals, he is the author of several book-length works (novels, short stories, poetry and literary criticism) that have been applauded nationally and internationally. An authority on Afro-Caribbean-Canadian literature, his works are on the syllabi of Canadian and foreign universities. They are frequently anthologized and are a focal point of the discussion of African-Canadian Literature. Des Vies, a French translation of his collection of short stories Lives: Whole and Otherwise (2010), will be published this year. Tuesday’s ceremony took place at the Circle in the Alphonse Desjardins Pavilion in the company of the university administrators, members of the cultural milieu and friends and relatives of the laureates. The other awardee was Claude Vallieres, lecturer in the Faculty of Music. The awards were presented by Sophie D’Amours, the vice-rector for Research and Artistic Creation.